Death of Monopoly: Want, want, WANT! Okay, so if you read this blog even semi-regularly you know I love Ticket to Ride. In fact, I think it is one of the greatest games ever made due to its simplicity and accessibility. 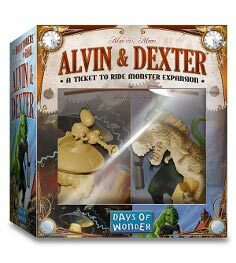 So I'm always eagerly awaiting another map or another expansion from Days of Wonder. Well, here it comes... Monsters. Yes, Godzilla-style monsters to block your routes. You can read all about it here. how did you feel about the dice expansion. i love this game as much as you seem to but never got the dice expansion or the card game. railways of the world the card game is a better ticket to ride card version than the actual card game. To be honest, the dice looked like a travesty. But I've heard good things. One day, I'll bite the bullet and give them a try. The card game is also on the wish list. It reminded me of Mamma Mia, which I already have. You tell me: Carcassone, a classic?